Adam Jones's international career is not over, according to Wales forwards coach Robin McBryde. British and Irish Lions prop Jones, 33, was dropped from the Wales squad for November's autumn international series. Wales play Australia, Fiji, New Zealand and South Africa in November and McBryde says there is still a chance for Jones to return. "The door hasn't been closed on Adam. It will be good to see him really fighting for his place," said McBryde. British and Irish Lion Jones, 33, won the most recent of his 95 caps in Wales' 38-16 defeat by South Africa in June. He was subbed during the first Test in Durban and was subsequently left out of the 31-30 second Test defeat in Nelspruit. Wales head coach Warren Gatland also says it is not the end for Jones but believes recent changes to the scrummaging laws have "dropped the value of tightheads by half over night". "The challenge has been set for Adam and hopefully he'll respond positively and it won't be that long before he's back with us," said McBryde. 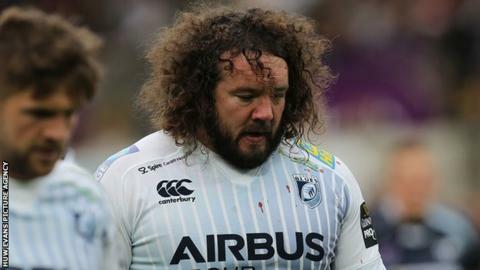 Mark Hammett, Jones's boss at Cardiff Blues believes his player is unlucky to miss out on selection. "I know how well Adam's done for us," said Hammett. "I'm seeing a good agility, a real workload. So whoever's propping up their [Wales] scrum must be doing a damn good job." Meanwhile, McBryde says Ospreys number eight Dan Baker has some way to go before he can claim a regular place in the national side. Former Wales and British and Irish Lions wing Dafydd James believes Baker should replace Taulupe Faletau in the side to face Australia. But McBryde said Baker is still struggling with a neck injury he suffered during Ospreys' 42-7 European Champions Cup win over Treviso. "We're just monitoring Dan he's got to pass some tests but he's in and around training," McBryde said. "Dan's playing well but you've got to say Taulupe Faletau is world class in his position as an eight and it's going to take something special to oust him from that position. "Dan's got a fair bit of work to do but he's heading in the right direction and he's coming in on the back of some strong performances for the Ospreys." Gethin Jenkins (Cardiff Blues), Paul James (Bath), Nicky Smith (Ospreys), Richard Hibbard (Gloucester), Emyr Phillips (Scarlets), Scott Baldwin (Ospreys), Aaron Jarvis (Ospreys), Samson Lee (Scarlets), Rhodri Jones (Scarlets), Alun Wyn Jones (Ospreys), Jake Ball (Scarlets), Bradley Davies (Wasps), Luke Charteris (Racing Metro), Dan Lydiate (Racing Metro), James King (Ospreys), Sam Warburton (Cardiff Blues, capt), Justin Tipuric (Ospreys), Dan Baker (Ospreys), Taulupe Faletau (Dragons). Mike Phillips (Racing Metro), Rhys Webb (Ospreys), Rhodri Williams (Scarlets), Dan Biggar (Ospreys), Rhys Priestland (Scarlets), Cory Allen (Cardiff Blues), James Roberts (Racing Metro), Jonathan Davies (ASM Clermont Auvergne), Scott Williams (Scarlets), Hallam Amos (Dragons), Alex Cuthbert (Cardiff Blues), George North (Northampton Saints), Tom Prydie (Dragons), Leigh Halfpenny (Toulon), Liam Williams (Scarlets).